With piston pounding engine sound.. Boxed. Schylling Jet Car With piston pounding engine sound. 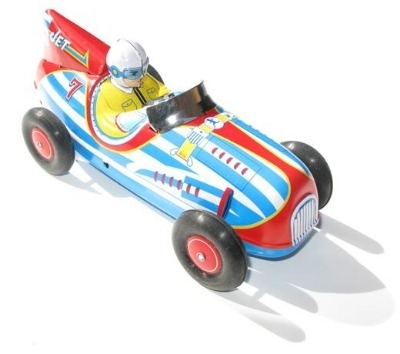 This Jet Car is an original model from the 'Schylling' range. Long-running Friction motor Motor which produces a load pounding engine sound - great fun !! Supplied in box original box. Box has signs of wear to edges. Old fashioned mechanical tinplate toys are still being made in several countries but, they are an endangered species. They are being killed off by the constraints of 'Toy Safety Legislation' .If you are intending to start or enlarge a tin plate collection do it now as the future of these toys is not certain!